Funny thing is that the picture used for "Germany Then" is a fragment of the Soviet movie "Come and See". The joke is on you!! all those "german badasses" are in fact Soviet Union actors. And the aforementioned movie is more badass than all those 3 countryes together. That was a comment for great justice. ^he is probably a fag. germany now is not even from germany. actually the bands name is tokyo hotel and no they are not from tokyo. i think they are american mexican. 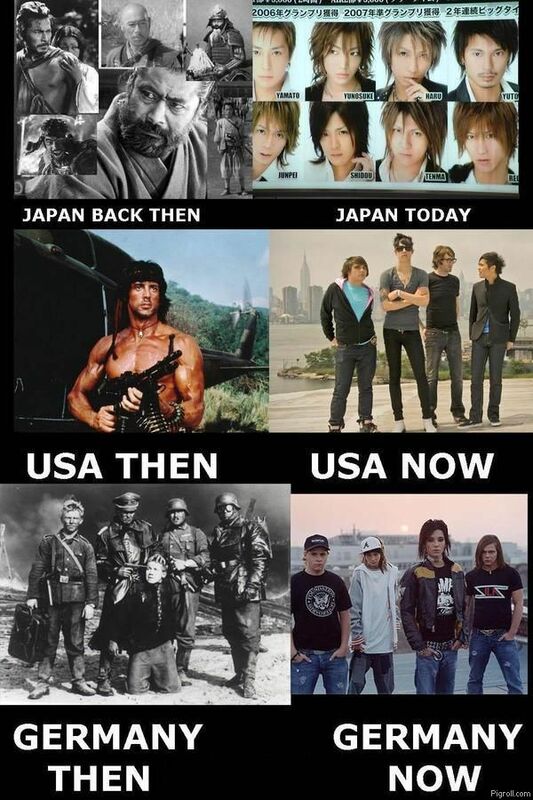 I really don't want to this being a Canadian, but for the USA now I'm pretty sure that's Marianas Trench, a Canadian band. Once again really sorry about that one. Yeah but 1910-1945 had two wars with over 100 million dead. Our two wars have killed a million tops and lasted longer. Before the name tokio hotel they had the name devilish. In a " tokio hotel "
No one is a fag or right or wrong, it is the Internet where people are entitled to their own opinions, where they put they're thoughts on digital paper. If you try to bring "justice" to the Internet table you will be persecuted and beat with mad comments against you. This is the greatest invention ever created yet it is the worst, just accept this as a funny picture, people need to take nazi jokes, racist jokes, with ease and have a laugh. I think I'm going really deep but I'm drunk and ill see you all in the morning. Remember don't believe everything you read on the Internet, quite from Abraham Lincoln.